Ever since Michael flew to North Carolina in 2010 to meet Ron Joyce, it’s been a chicken love fest. 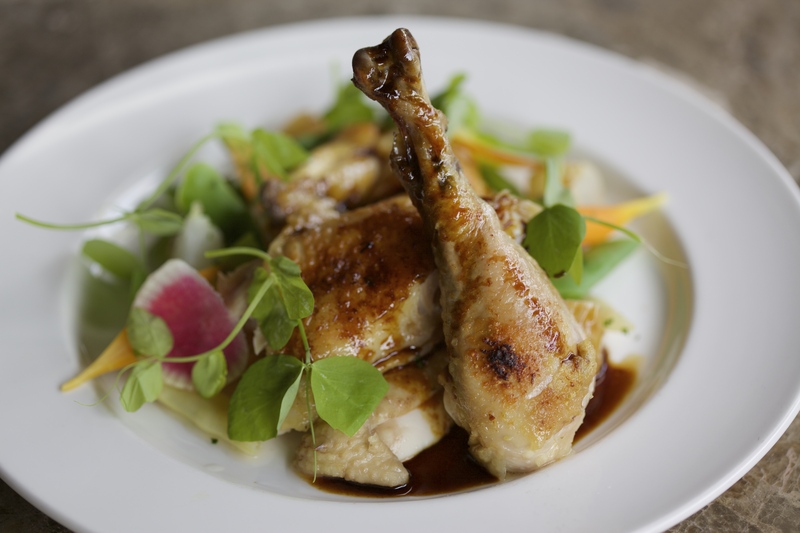 Joyce Farms is our supplier of Poulet Rouge Fermier chicken at Michael’s Genuine Food & Drink and The Cypress Room, a heritage French farm breed that Joyce brought to the U.S. as the exclusive North American producer. The Redbro Cou Nu, or red feathered naked neck, is known for its superior taste, better meat texture and a thinner skin that finishes very crispy compared to most chickens. And, as Michael saw firsthand, Joyce complements nature with nurture, raising the flock on small Carolina farms and allowing them to grow slowly and mature naturally than conventional factory farmed chicken. They roam free or take comfort out of the weather in cooled or heated areas. Michael showed the love in a recent issue of Saveur for Joyce Farms and this beautiful bird! Says sous chef Michael Beltran of The Cypress Room, “Joyce’s poultry is by far some of the most consistent, high quality product I have ever had, which is so important to us in the kitchen.” Beltran and chef de cuisine Roel Alcudia now also source beef tenderloin from Joyce Farms for the restaurant. Beltran continues, “It’s got to be the best flavor I’ve ever gotten out of a grass fed beef. Cooked medium rare, it’s buttery and you get a touch of game but it’s not overwhelming. I’ve never had anything quite like it. It’s the most perfect filet. Right now we’re serving it at dinner with long beans, creamed kale, marble potato and radish.” Looks like we have our next recipe, chef! Today we offer Michael’s Pan-Roasted technique with Michael’s Genuine Food & Drink chef de cuisine Niven Patel’s current set up for the menu – giardiniera. Giardiniera is an Italian or Italian-American relish of pickled vegetables in vinegar or oil. Italian giardiniera is also called sottaceti (“under vinegar”), a common term for pickled foods. Typically eaten as an antipasto or with salads, the Italian version includes peppers, celery, carrots, cauliflower and gherkins marinated in oil, red- or white-wine vinegar, herbs and spices. In Chicago, they like it hot or mild, sometimes with crushed red pepper flakes. 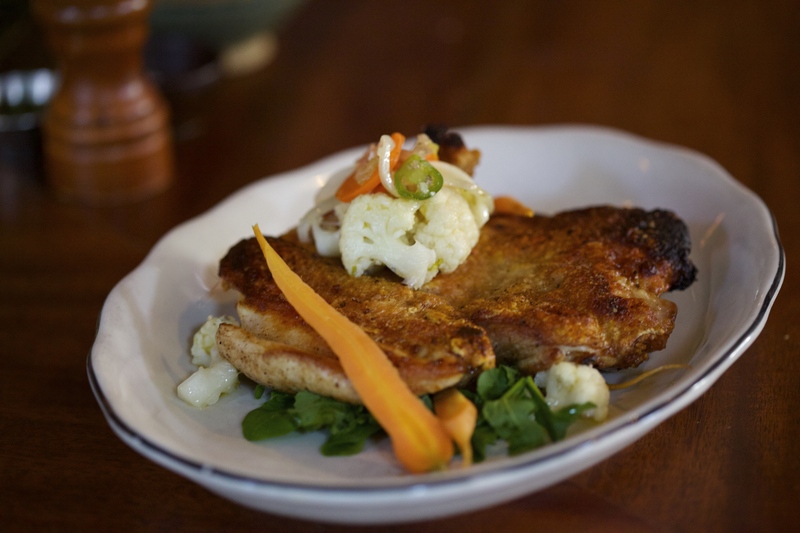 Giardiniera is a very versatile condiment – even for chicken! The Cypress Room features Poulet Rouge in its Daily Rotisserie with Market Vegetables for both lunch and dinner. If you can’t splurge for the Poulet Rouge, available from Joyce’s website, a great naturally-raised bird will do just fine. This is one of those dishes where patronizing a local butcher, instead of a chain grocery store, will mean success. To halve and bone a couple of chickens is not an easy task, so leave it to the experts. Be specific with your butcher: request boneless chicken halves, meaning the first joint of the wing is clipped off and the only bone in the bird is the one that attaches the lower part of the wing to the breast, also known as an “airline”. As an alternative, buy boneless chicken parts. There aren’t a lot of ingredients to this dish; it really is all about the quality of chicken and couple of well-seasoned cast iron skillets. To get the super crispy skin, it is imperative that the chicken lies flat in the pan. Place 2 cast-iron or heavy-bottomed ovenproof skillets over high heat; cast-iron will yield a crispier skin. Season the chickens generously with salt and pepper; you should see the seasoning on the meat. Coat each pan with 2 tablespoons of oil. Once the oil gets hazy, lay the chicken halves in the pans, skin-side down. It’s super important to make sure the chicken lies flat and all of the skin is in contact with the pan. Cook until the skin starts to brown, about 3 to 5 minutes. Do not move the chicken or the skin will tear. Transfer the pans to the oven and roast until the juices run clear when the meat is pierced with a knife, about 20 minutes. Transfer the chicken to a warm platter, skin-side up. To make a quick pan sauce, pour out the excess fat from the pan drippings. Place the pan over two burners set on medium-high heat. Add 2 tablespoons of wine to each pan. Using a wooden spoon, scrape up the brown bits stuck to bottom of pan. Add a tablespoon of butter to each, stirring to melt, and sprinkle with parsley. To serve, lay a half roasted chicken on top of each plate, skin-side up. Drizzle with the pan sauce and top with a mound of giardiniera. In a large bowl, add long beans, carrots, celery, peppers and onions. Dissolve salt in 3 pints of water, and pour over vegetables. Cover with plastic wrap and let sit 8 hours. Thoroughly rinse, dry, and return to bowl adding cider and white vinegar, olive oil, canola oil, oregano, and garlic and marinate overnight. It’s ready to serve the next day!